Minecarts are vehicles featured in some stages. Minecarts appear in several levels of the Subspace Emissary. Once a character gets into a minecart by touching it, the minecart closes and starts hurtling quickly along the rails ahead. The minecart deals massive damage to any enemy it hits. While inside the minecart, characters cannot be hurt, though they can be KO'd if the minecart passes a blast line. Characters can jump out of a minecart at any time; this is necessary to avoid being KO'd if the minecart's path takes it off an edge. Minecarts can also end their path by crashing into a wall, which pops its occupants up slightly into a state of tumbling, though without damaging them. The speed of minecarts increases with the chosen difficulty. A minecart crashing into Primids. After crashing into a spiked wall, the minecart is wrecked. An exclamation mark appears to signify that the minecart is about to fall off the track. A minecart in The Great Cave Offensive. A different kind of minecart appears in The Great Cave Offensive. These minecarts resemble traditional minecarts, and are much slower. Two of them appear on the stage; one on the left and one on the right. The one that goes left will drive into the bottom right of the stage, right below the spikes and the other one will drive all the way into the left blast line. The minecarts will cause damage and moderate knockback to anyone it rams in to. When a minecart appears it will flash white for a moment. If a minecart is left alone, it will start speeding down the track on its own. Kirby rides a minecart in Kirby Super Star's Great Cave Offensive subgame. 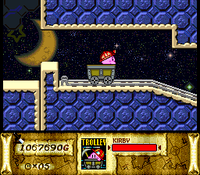 The main concept of minecarts originates from Kirby Super Star, where Kirby could find slow minecarts in various locations that would take him across stages safely while destroying anything in the way. However, the speed of Brawl's minecarts is more reminiscent of the Donkey Kong Country series, where quick reflexes are required to jump in order to dodge obstacles and enemies in minecart stages. This page was last edited on March 24, 2019, at 13:01.